Honda admited nervousness from year 1996. Blade was a long time on the top of selling charts. And rumours were spreading about new competitor's models . Yamaha replaced FZR1000 Exup by YZF1000R Thunderace, Thunderace paper data were impressive. Honda therefore adjusted Fireblade like never before to be able keep fighting with competitors. Honda introduced 1996 Blade on the end of 1995. Though the look wasn't too different from previous model it was practically new bike. 893cc engine disappeared and was replaced by 918cc one. Dry weight droped down 1 kg on 184 kg and power increased for 5 HP on 128 HP. Supply of power was more flatten. First test spoke about what kind of miracle Honda achieved with rebuild of CBR. Bike was faster, better manageable a hard ride was easier. Honda keeped first position among supersport bikes. The Thunderace was more powerful (145 HP) byt with dry eight 198 kg was too heavy. Tilt the bike into the curve required a lot of effort and the hoods made bike much bigger than CBR. 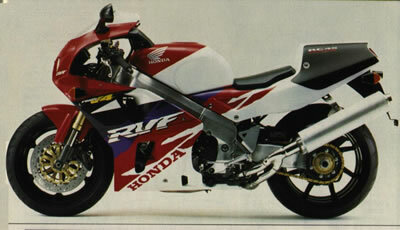 But FireBlade buyers were pleased, because otherwise Honda wouldn't improved its CBR so much. Except new engine CBR got lighter hoods, different riding position and lower tank (about 10 mm) and higher handlebars, narrower and stiffer frame and lighter crank and bent cooler and more durable exhaust. Front 16'' wheel stayed without change. Changes in engine, which included stiffer crankchaft, smaller alternator etc. brought 3 Nm moreof torgue.